Cleopatra Slots | Play Online and Win FREE Spins! Cleopatra is Queen of online slots, popular with Pharaohs & fans alike. 3 Sphinx symbols unlock a bonus level with 15 free spins! Cleopatra Slots is immensely popular in land based casinos and has likewise gained popularity amongst online players. Developed by WMS, Cleopatra Slots offers players many exciting features and excellent winning opportunities! The gorgeous, gilded reels are packed with Scarabs, Eye of Ra, and hieroglyphic symbols that all fall into the Cleopatra Slots theme. Spin the reels to complete a payline and you will win! The special symbols in Cleopatra Slots include the Sphinx and the Cleopatra Wild. Get at least three Sphinx symbols and trigger a bonus of 15 FREE Spins with tripled payouts. The Cleopatra Slots Wild symbol can replace other symbols to help you complete winning combinations while doubling your wins! 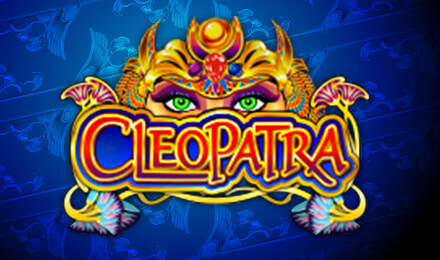 Are you ready to play Cleopatra Slots? Learn more about how to play before you start spinning the reels. 1- Select your Line Bet – Click on the ‘LINE BET’ plus and minus arrows to adjust your bet per line. 2- Select the Number Of Lines – Click on the 'LINES' controls to select the number of paylines you wish to play. 3- Click Play - when you're satisfied with your wager and lines, click the 'PLAY' button to spin the reels. The Max Bet feature allows you to play the maximum bet amount in a single click. The Max Bet offers the chance to win the most on Cleopatra Slots. Click the 'MAX BET' button on the bottom right of the game screen to bet the maximum on each payline. The beautiful Cleopatra is the Wild symbol on the game. The Wild can help you complete winning payline by substituting for other symbols. Additionally, Cleopatra Wild wins will pay out double! If you get 3 or more Sphinx Scatter symbols on the reels you will activate a Free Spins Bonus. Your 15 free games will play out automatically and triple any wins achieved during this round. Where can I play Cleopatra Slots? You can play Cleopatra Slots online here at Moon Games! Simply log in and start spinning those reels! Plus, Cleopatra Slots is also available on mobile so you can travel to Ancient Egypt and win from any location!